Mythology: Artemis (pronounced ar’teh-mis) another multidimensional Goddess reduced by the Greeks to the domain of moon, virgin, huntress, and childbirth, really represented the Feminine in all her aspects. She was the huntress who protected animals and the virgin ( whole and complete unto herself) who made love in the woods. When Artemis was a little girl, Zeus, her father, wanted to give her a gift and asked her what she wanted. 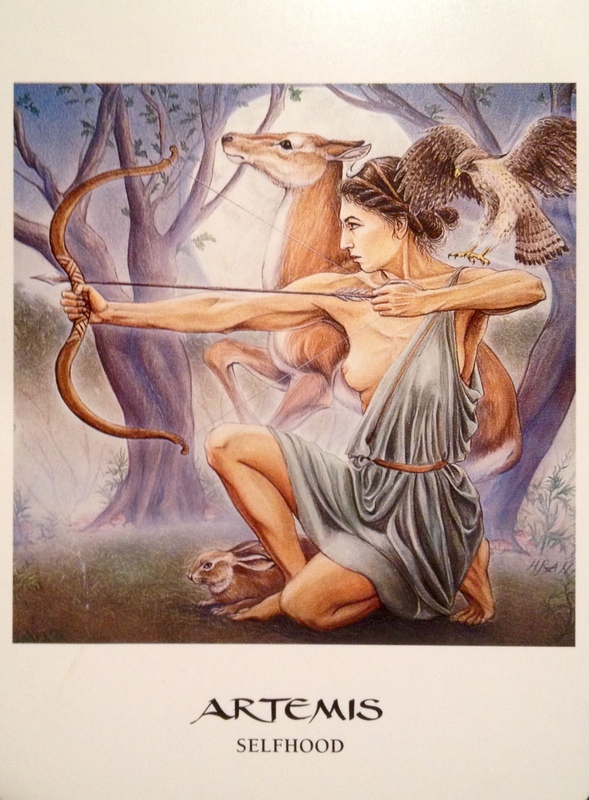 Artemis replied” I wan tto run forever wild and free with my hounds in the woods and never, ever marry. Tomorrow is the full moon and lunar eclipse and this is a call to connect to the powerful aspect of your Divine Feminine Warrior. It is imperative that you honour this aspect of yourself, reconnect with her and make precious time to nurture this connection. She will guide you to grow and expand; to put yourself first and cut away those who would hold you back from being the strongest, truest and most powerful version of yourself. Feel her energy embrace you. Feel your Wild Woman within come to life and move through you, heating up the blood in your veins, forcing you to move forward with focus and determination. Nothing can hold her (You) back. There will be a separation of sorts, as you reclaim your power and break away from seeking the approval or acceptance of others. You have the chance to galvanize yourself against their old judgment and opinions… those that used to push your buttons or get under your skin will no longer touch you. You will be immune. Having no desire to participate in the drama, you will simply walk away. And as you do so, you will reinvent yourself from the outside as you reconnect with your true authentic self on the inside. You will set a much higher bar for those who wish to engage with you, a higher vibration that they must match to be close to you. This is not an indication that you are any “better” than anyone else, only that you desire a deeper connection and will no longer be able to tolerate toxicity, falsity or negativity. When you find yourself at this turning point, you will become self sufficient. Knowing that the Universe always provides.